The Outlaw Pad - What is Acute Laminitis? The Outlaw Shoe - How It Works! The Outlaw Shoe - What is Founder in Horses? What is Founder in Horses? 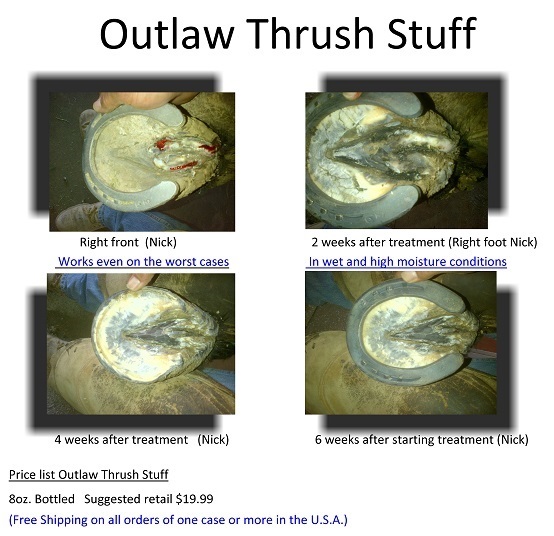 The Outlaw Thrush Stuff was designed as an aid in preventing and treating infected feet in horses. It is applied directly to the bottom of the hoof capsule. As an antiseptic and astringent it kills the bacteria/fungus in the hoof and dries the affected area protecting it. Works great, cost effective and strong enough to do the job even in wet conditions. Thrush is an athlete's foot kind of fungus that horses can get. The fungus grows in the ground and so to clean the horse's feet we recommend the Outlaw Shoe Thrush Stuff. 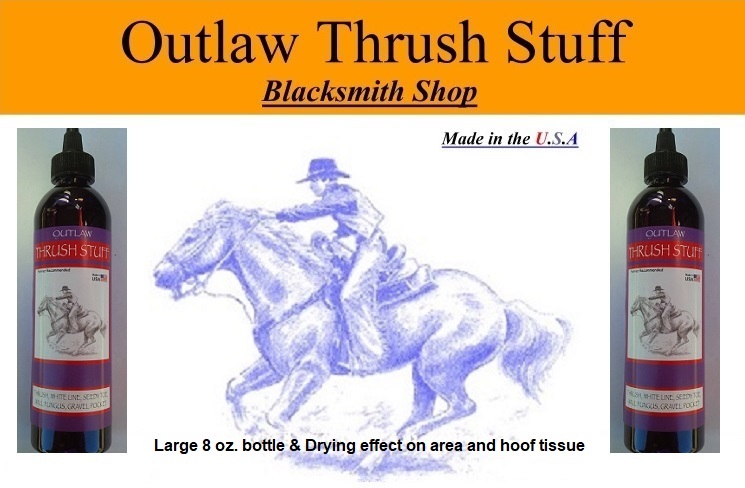 You can order the "Outlaw Thrush stuff" in 2 sizes (4 ounce bottle, 8 ounce bottle). Stephen E. O'Grady, DVM, MRCVS - "Treatment is directed at restoring the normal physiology of the foot through proper balance and trimming, adequate exercise to encourage frog stimulation, and debridement of all devitalized tissue. Application of any number of antiseptic or astringent preparations". Resolve the associated bacterial infection. If a chronic lameness is present, the underlying cause must be diagnosed and corrected. Dr. Stephen E. O'Grady is an equine practitioner and farrier practicing in the Northern Virginia area. He is also a member of the Farriers Liaison Committee of the American Association of Equine Practitioners. Disclaimer: Independent claim not affiliated or associated with Outlaw Thrush Stuff. Thrush is a degeneration of the frog with secondary anaerobic bacterial infection that begins in the central and collateral sulci. The central sulcus is more commonly involved if the horse has sheared heels; the lateral sulci are primarily involved in the majority of cases of thrush (without sheared heels). The affected sulci are moist and contain a black, thick discharge with a characteristic foul odor; the borders of the frog are commonly necrotic. These signs alone are sufficient to make the diagnosis. Although many describe the primary etiology as a moist environment with poor hygiene, it is more likely caused by poor foot conformation or trimming and lack of exercise (thought to help "clean out" the sulci when the weight of the horse pushes down on the frog and surrounding structures) than from lack of hygiene in the stall. However, a moist environment should be avoided in animals with thrush. 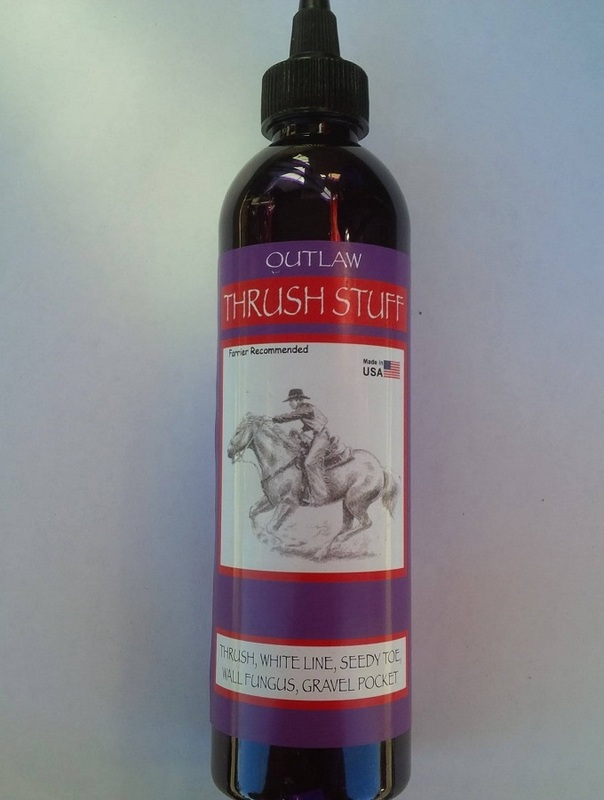 Outlaw Thrush stuff is the only antiseptic and astringent on the market today ask at you local supply house or order now by clicking here you can have it in no time. The faster you start treatment the less your horse has to suffer with thrush. Works on the most stubborn cases and can be used as a preventative also.